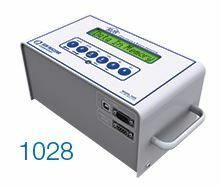 We use Sun Nuclear’s model 1028 which is one of the most sophisticated instruments on the market today. You will receive a complete report the same day the test is done. 2 standard methods exist for testing a home for the presence of radon gas. 1. Short-term testing methods are designed to provide a quick radon value. Short-term tests can be as short as 48 hours and as long as 90 days. 2. Long-term testing methods are designed to provide an annual average of radon gas. Long-term tests run for a minimum of 90 days, and usually for 6 to 12 months. The EPA recommends performing a short-term test for radon. If that test comes back below the EPA Action Level( 4.0 pCi/L), then no further immediate action is warranted. However, the home should be tested again after any air sealing work, heating/air conditioning system changes or foundation modifications. 1. If the short-term test returns with a radon value of 4.0-10.0 pCi/L, the EPA recommends performing a long-term test to gauge the home's annual radon concentration. The results of the long-term test should be used to determine the necessity of radon mitigation (reduction). Another option is to conduct a second short term test if quicker results are desired. 2. If the first short-term test returns above 10.0 pCi/L, then the EPA recommends performing a second short-term test to verify the results and using the average of the two short-term tests to determine the necessity of radon mitigation. You can see payng for these tests could be quite costly. Performing this test is really quite simple. Just follow directions. If the results show elevated levels, you may then want to call a radon mitigation company. Is testing for radon gas accurate? Yes. The largest source of error in radon testing does not come from the type of device used, but rather from the failure to maintain appropriate closed house conditions during the period of the test. It is important to carefully follow test kit instructions if you want accurate results. The accuracy of almost all commercially available radon measurement devices has been evaluated in the Environmental Protection Agency's (EPA) Radon Measurement Proficiency Program (RMP). This program exposed the devices to established radon levels and returned them to the company or individual for evaluation. A minimum passing requirement was that the result must have been within plus or minus 25% of the established radon levels. Most devices have better performance at the EPA guideline level of 4 Pico curies per liter of air. Laboratories and measurement service providers have quality assurance programs and controls to maintain reliable performance and accurate results.